When your loved ones know you are making white cheddar macaroni and cheese dinnertime will be highly anticipated. I know I am a true Mac fan because I have always loved it whether it is from a Kraft box with powdered cheese or full of gooey goodness at Cracker Barrel. One day, when I was really little, I was at Cracker Barrel trying to find exactly what I wanted. I was a super picky eater (well, let’s be honest, I still am!) and it was so hard to find something I liked on the menu. When I saw a dish of mac and cheese, I asked for it, without chicken, and waited patiently to enjoy something that I thought would be totally different. I thought what I would be getting was a bowl of Kraft mac and cheese. It would be runny with milk and have that classic powdery cheese taste. But boy was I wrong. What I received was a big bowl of huge pasta shells covered in a white sauce. I was baffled. But I figured I would give it a try (I think I only really tried it because I was that hungry!). I was blown away. This white cheddar macaroni and cheese was absolutely amazing. Apparently, it was white cheddar cheese with another one that I could not catch and mixed with cornstarch and flour to make that perfectly thick cream of a sauce. 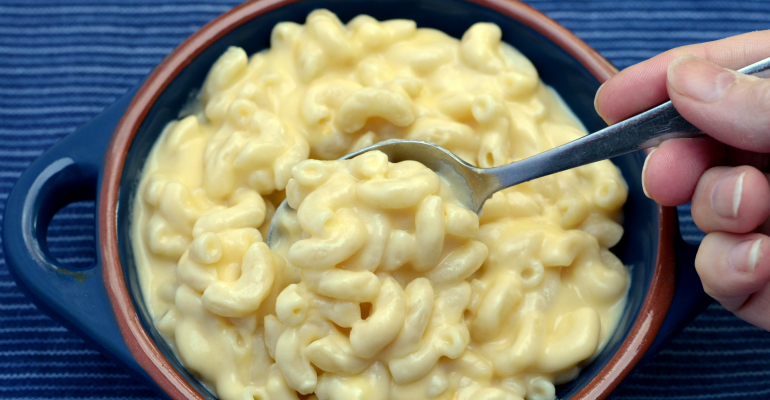 USE THE RED NEXT PAGE LINK BELOW FOR THE WHITE CHEDDAR MACARONI AND CHEESE RECIPE. Quick Tip: Use any combination of cheese that you’d like in this white cheddar macaroni and cheese recipe.